Enjoy peace of mind with Al Haddad Motors during The Holy Month of Ramadan with exciting new promotions. It’s that time of the year again when new car buyers rush to their nearest car dealers to take advantage of the fantastic offers on hand. So, if you’ve ever dreamt of owning a Mercedes-Benz, now is your chance to change that into a reality. Throughout Ramadan, Al Haddad Motors has exclusive deals on all Mercedes-Benz models with tailor-made packages that cater to you and your family. With an all-inclusive driving package, get your dream car hassle-free. Among the benefits included in the package is exclusive Ramadan pricing on all Mercedes-Benz models, along with insurance and registration. In addition to this, Al Haddad Motors is offering up-to-three-year service packages, designed to ease your mind, that include vehicle checks by highly qualified and professional technicians. Don’t miss out on your chance to own your dream Mercedes-Benz with an all-inclusive driving package. 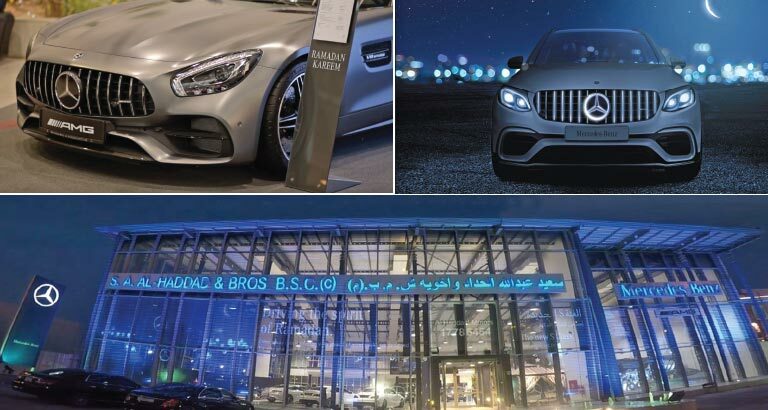 Established in 1958, Al Haddad Motors, the sole authorised general distributor of Mercedes-Benz in the Kingdom, continues to provide its clients with the most comprehensive and highest level of service. Al Haddad Motors ensures customer satisfaction by providing clients with unprecedented vehicles as well as excellent customer service. Call the showroom on 17 785-454 or visit the Mercedes-Benz website https://mercedesbenzme.com/bahrain/en for more information.